I think my neighbors are starting to know me as “crazy lady that works out with her garage door open”. Who can blame me though? My overpriced California home is small and inundated with toys. 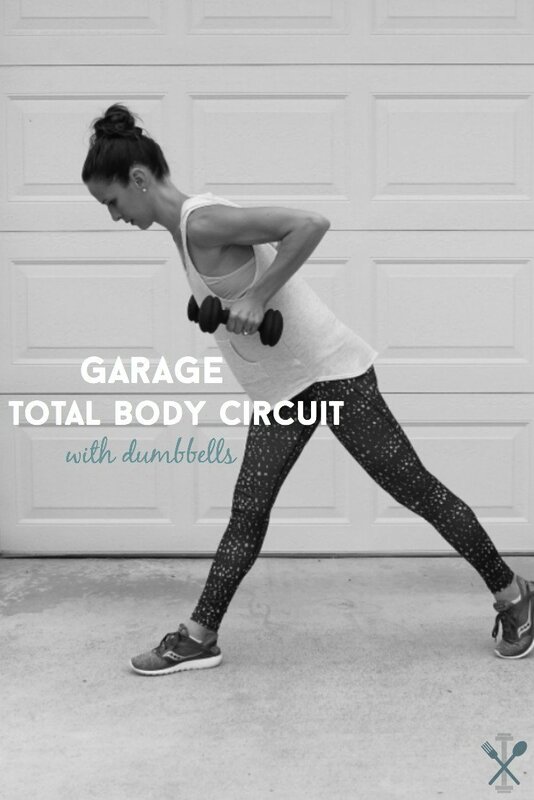 So when I need a good workout during nap time, I do this garage total body circuit with dumbbells. Yes yes, these photos are taken in front of my garage, with the door CLOSED. Because I figured the christmas tree box, the strollers, the power tools, and the outdoor toddler toys would be a tad too distracting. Who is with me on the garage workouts thing? HOLLA! It’s like you own little room in the gym, except maybe dirtier with less equipment. 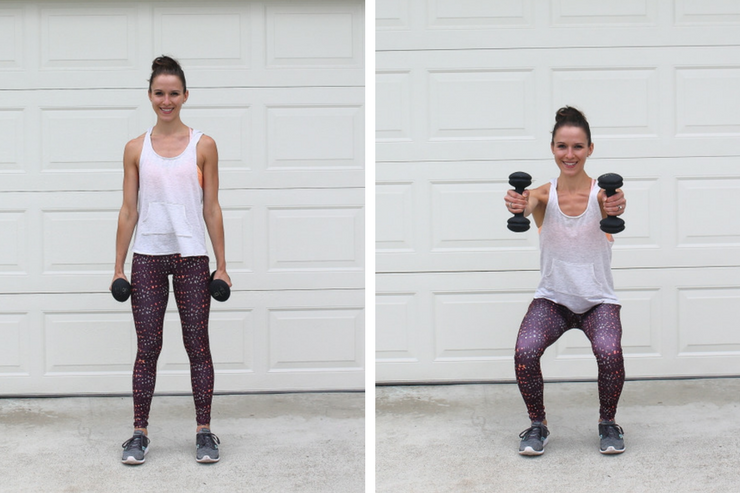 BUT HEY, all you need for this total body circuit with dumbbells is…well of course, dumbbells. THEN you can bust through this workout, shower in your own shower (vise the communal gym ones), and save yourself the drive. Ok total transparency – I love going to the gym to workout. Alone time, with every piece equipment available, and classes – oh how I love classes! But sometimes it’s just not doable for busy moms. So I try to see the silver lining. I love my own shower…I love my own shower. Buuuut my shower just doesn’t trump the gym. Especially my hometown gym Fortis Fitness & YOGALUX. I’m so excited to partner with this class-act institution – barre, yoga, HIIT, spin, TRX, and bootcamp are just a few of the amazing workout genres they offer. And one word – CHILDCARE! (insert praise emoji here). Truth be told I’ve seen the shower here, and it’s probably even cleaner than my shower at home. I can’t wait to post some amazing workouts that will surely be inspired by my time spent at Fortis & YOGALUX. If you live in the San Diego area or come to visit, they are DEFINITELY worth checking out! Now, back to this workout. If you’re unable hit the gym this week, just find your motivation mantra in the garage. And if you are one of the lucky ones to have a hometown gym you love like I do, this is a great circuit to do there too! Start with your feet wider than hip-distance apart. Take hold of one dumbbell and bend over to your right side, letting the weight hand in front of your right foot (knees also facing that direction and weight on your right foot). Next, lift the weight up to you chest as you extend your legs to standing. 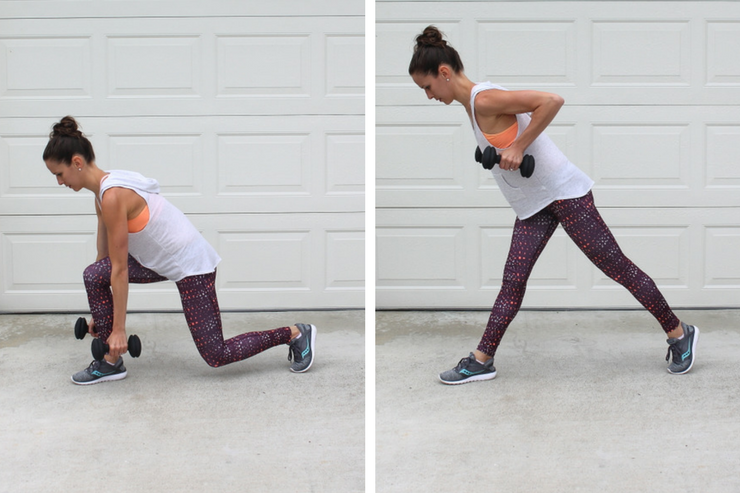 Shift your weight to your left foot and press the dumbbell overhead. Bring the weight back to the center of your body as you shift back down to the original position. Do 6 repetitions on one side, 6 on the other. 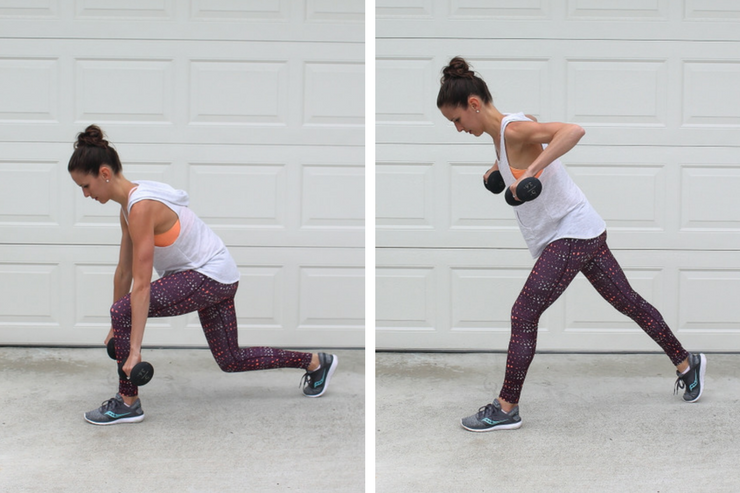 Grab both weights and start with your feet apart and right foot in front. Bend your knees to a lunge (both knees at 90 degree angles, bodyweight on your right foot) and let the weights hang near each side of your right foot (palms facing in). Next, extend your legs as you bring the weights in towards your shoulders, elbows pressed in towards your body. Lower the weights and bend your knees to return to the original position. Do 12 repetitions. Start with your left foot in front, executing the same type of lunge as above, and let the weights hang near each side of your foot, palms facing down. Extend your legs as you lift the weights up towards your shoulders, this time pushing your elbows out and behind your back. Do 12 repetitions. Start with your feet hip-distant apart, weights resting on the sides of your outer thighs. 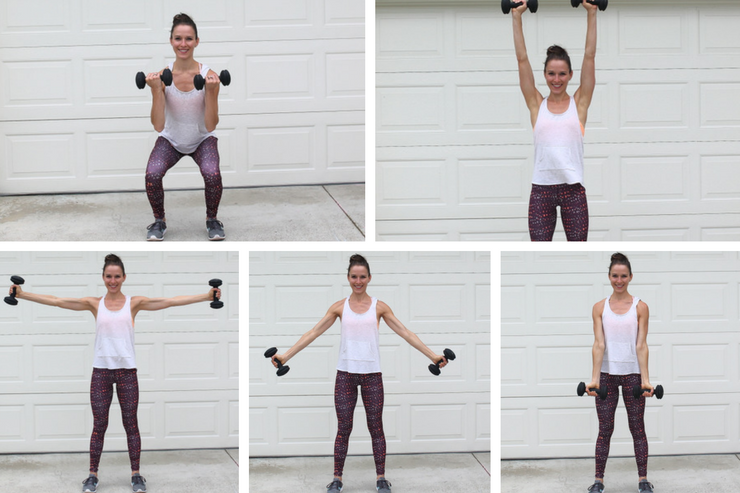 Next, bend into a squad position (making sure your knees don’t shoot past your toes) and lift the weights to shoulder height (palms facing each other). Extend your legs back to standing and lower the weights to the original position. Do 12 repetitions. Once again start with your feet hip-distance apart. Bend into a squat position as you bring your weights up to your shoulders for a bicep curl (palms facing up). Extend your legs as you lift the weights overhead, palms facing forward. Next, slowly lower the weights while keeping your arms extended until the weights meet at the tops of your thighs. Do 12 repetitions. Start with your feet wider than shoulder-width apart. Lift your weights overhead, palms facing each other. Next, bend your knees to execute a deep sumo squat position as you lower the weights behind your head, keeping your elbows in towards your ears and stationary. Extend your legs and arms back up. Do 12 repetitions. Set one weight aside and start with your feet wider than shoulder-width apart. Take the weight and slowly bring it up and around your head, rotating from right side to left. End at your hip and do the same motion on the opposite side. Do 12 repetitions, alternating sides. Complete this entire workout four times through for the best dumbbell workin’, garage lovin’, gym goin’ workout! Tip: use a set of dumbbells that feels challenging half way through one set. Choose a lighter set during the shoulder work (squat shoulder raises and bicep curl around the worlds) if needed. A basic set like this one is great for beginners, or this 10lb set for advanced levels. Disclaimer: Please note there may be some affiliate links on this page and will earn a small commission if you purchase through those links. However, all opinions are my own. Thank you for your support. This is so helpful especially if you’re looking to do a full body workout but don’t have time to go to the gym. Love that all you need are dumbbells. I have like 4 sets of dumbbells in my garage! Never know when you just need to bust out a workout with some weights, right?! Love woodchops! So good for the core. And I am going to have to try the worldwide biceps curls in my classes tomorrow!! Thanks and great workout out! The around the worlds are killer!! I have to do them so slow because they work so many muscles. I hope your class loves them Sarah! Yes! This looks amazing! It is the perfect total body workout and can be done anywhere. Thank you for sharing. Yep, you’re welcome Jessica! Thanks friend! I love a good dumbbell work out! We use them a lot in my barre class and you work out muscles that you did not even know you had! Also, this is great for those days when you don’t have time to go to the gym. I LOVE using the weights for barre! Except I use WAY lighter ones! All those repetitive movements are killer! I love routines like this that don’t require any special equipment. Pinned and trying it soon! Its okay–i workout in my small teeny tiny living room and roll our coffee table out of the way–haha! Whatever works! Thanks for sharing! At home workouts are the best. And the part about your neighbor thinking you are crazy! LoL. I’m always looking for new workouts to try out at home when I can’t make it to the gym. This looks like a great one to add to the list! It’s a great one for those ‘non-gym’ days. Then once you’ve mastered it you can go to the gym, do the same thing and show off 😉 Hehehehe! Wow! what an idea. this never struck me, I am totally motivated. Thanks for sharing. YAY glad this workout is a ‘lil inspiring to you! Thanks Gunjan! Been looking for my dumbbell workouts to incorporate into my excercise regime! Thanks!! You are so welcome Abbey! I am a big fan of working out at home because it’s just easier. 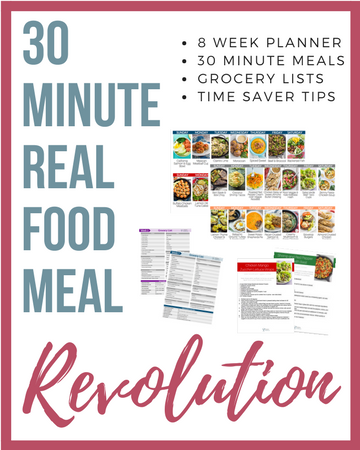 This is a great guide! Thanks for sharing! 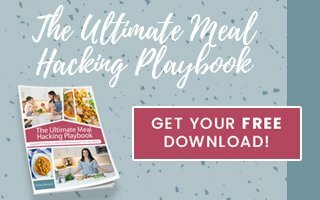 It can be super easy to just bust it out at home, especially with little ones! Thanks for stopping by Tram-Anh! Totally adding this in to my workout this weekend! Heck yeah! Get it done! Girl, you are inspiring! I have dumbbells and with this total body work out, I have no excuse. I really need to get with it! Working out at home would be so much easier with my schedule. Helpful post! Awe thanks Jessica! 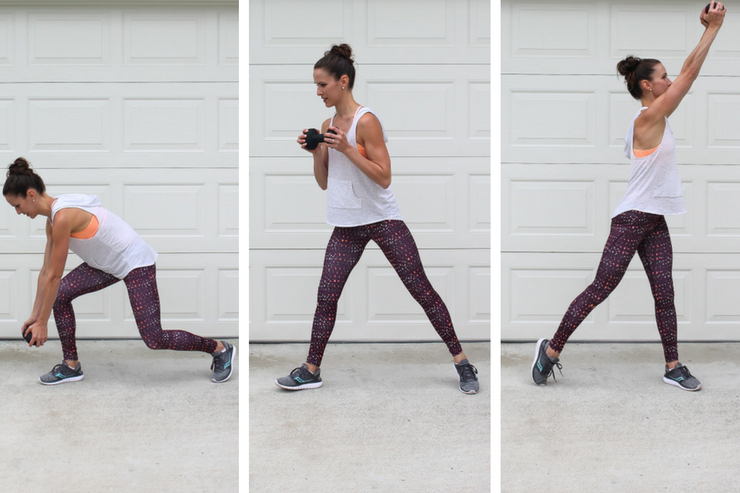 I hope you give this workout a whirl, it’s pretty quick too. You got this! BOOM. How do you like those Sauconys? Was just thinking about getting a pair myself. Love my Kinvaras for running. Need something for general gym use. I REALLY do! I use Asics for running but I got this pair for cross-training and I’m obsessed. I think I need to try their running line. I feel like I’m walking on a cloud with the Form2U style. Get a pair – you won’t regret it! Oh this is absolutely incredible! 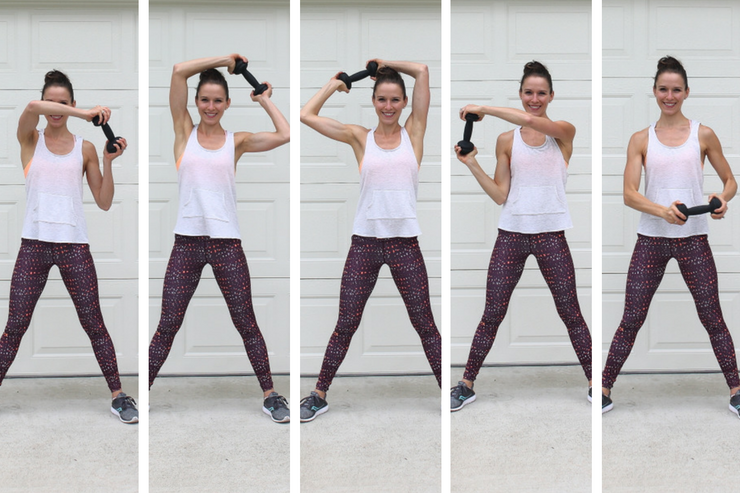 I love how you can do these exercises in your garage too. Thanks! YES – garage, gym, wherever! Wooohoo! Congrats on that partnership, my friend! Thanks Brie! I’m totally stoked to work with Fortis & YOGALUX! This is perfect for me! I have GOT to make time for weights again. YES!!!! It’s so easy to just bust out at home when you have time! Thanks Kerri.